Edition limited to 40 embossed, signed and numbered intaglio prints. "Madonna and Karl" Single etching printed in two colors and mounted into a beautiful gilt frame. 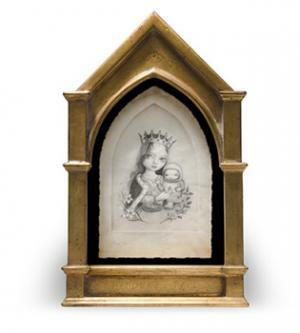 Artwork by Mark Ryden for Pressure Printing. Print size: 5.5" x 6.4" Frame size: 10.25" x 16.75" x 1.75"